It can be difficult to have a successful therapy session with a young client who is hyperactive or has trouble focusing. Here are some suggestions of things that parents can do with their child before an appointment so that the child is better prepared for a productive therapy session, as well as some things you can add to your waiting room to help families. Hyperactivity in children with autism or ADHD, as well as other diagnoses with behavioral issues, often worsens when the child is taken to a therapy session away from home. 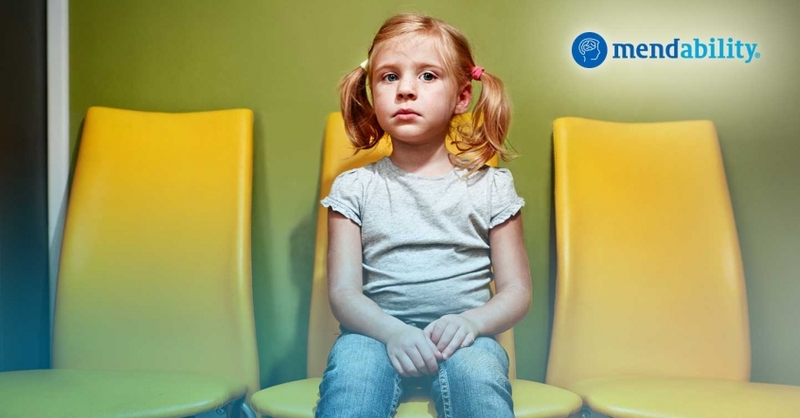 Even when the child has a great relationship with the therapist, the transition, the car ride and then the time spent in the waiting room can exacerbate a child’s anxiety and hyperactivity. Children who work to complete these exercises in a given time will have used a lot of organized energy and will have oxygenated their brain and body, leaving them more ready to pay attention in your session. Visual schedules are used successfully in many schools to help children with autism and other developmental delays manage transitions 2,8. Children who can read an analog clock and understand the passing of time may appreciate interacting with a clock with moving hands. In your waiting room, or at home, parents can help their child to move the clock’s hands to the appointment time on their poster and then compare this with the current time. This may help a child to understand when it is getting close to the time to leave the house, for example. Research shows that children with autism with speech delay show aggressivity when they are hungry or dehydrated. Parents should ensure that their child has had enough to eat and drink in order to avoid agitated behavior related to hunger or dehydration and improve their performance during their therapy visit 15. Children with autism or ADHD often have challenges related to eating problems, which can make them prone to being hungry or thirsty more often. These children may also have communication issues that prevent them from expressing these kinds of needs effectively. It can be very helpful to offer a child a snack and a drink to try to anticipate their needs. Studies show that pleasant aromas in a waiting room can help decrease anxiety, for example before a dental appointment3,7,9. Take advantage of the impact of smell to reduce anxious behaviors by adding scent diffusers in your waiting room. Processing pleasant scents has been shown to have a positive impact on the areas of the brain that manage stress, emotions and behavior. Don’t forget that each person responds differently to different sensory stimuli. The same is true for scents 13. In the case of lavender, for example, some of our clients have commented that they find that lavender is a relaxing scent, while others have remarked that they feel more excitable after being exposed to it. In addition to providing a diffuser in your waiting room, you may also choose to advise parents to bring a scent that their individual child particularly enjoys. They can keep this scent in their bag and the child can smell the lid of the bottle to enjoy their own favorite scent. We recommend that you invite parents to spend time experimenting with scents, looking for the ones that their child will enjoy the most. Generally, young children, both those with and those without neurological deficits, tend to prefer sweet smells 13. A plug-in or essential oil diffuser can be easy to maintain and will instantly change the sensory impact of the waiting room. Mendability has gathered many positive comments from parents using the multi-textured path as a soothing exercise for their children. This can be easily adapted to a waiting room. Walking on the Mendability multi-textured path provides a child’s brain with strong and organized tactile information coming all the way from the soles of the feet. In your waiting room, set up five to six welcome mats and surfaces of different materials in a line to create a path of contrasting textures for children to walk on at will as they wait for their appointment. (One way to keep the multi-textured path together is to and glue the mats onto a long, thin wooden base). Invite the parents to help their child walk back and forth on the multi-textured path, holding the child by the hand. It is possible for children to have a positive experience in a waiting room. Helping parents to prepare for the time in the waiting room and also offering some activities for children in the waiting room can make a big difference. Note: If your service includes visiting the families in their own homes we will have another article for you. Akhlaghi M, Shabanian G, Rafieian-Kopaei M, Parvin N, Saadat M, Akhlaghi M. Citrus aurantium blossom and preoperative anxiety. 2011;61(6):702–712. Bryan LC, Gast DL. Teaching on-task and on-schedule behaviors to high-functioning children with autism via picture activity schedules. 2000;30(6):553–567. Fenko A, Loock C. The influence of ambient scent and music on patients’ anxiety in a waiting room of a plastic surgeon. 2014;7(3):38–59. Hasheminia D, Kalantar Motamedi MR, Karimi Ahmadabadi F, Hashemzehi H, Haghighat A. Can ambient orange fragrance reduce patient anxiety during surgical removal of impacted mandibular third molars? 2014;72(9):1671–1676. Koulivand PH, Khaleghi Ghadiri M, Gorji A. Lavender and the nervous system. 2013;2013:681304. Lehrner J, Eckersberger C, Walla P, Pötsch G, Deecke L. Ambient odor of orange in a dental office reduces anxiety and improves mood in female patients. 2000;71(1-2):83–86. Lehrner J, Marwinski G, Lehr S, Johren P, Deecke L. Ambient odors of orange and lavender reduce anxiety and improve mood in a dental office. 2005;86(1-2):92–95. Massey NG, Wheeler JJ. Acquisition and Generalization of Activity Schedules and their Effects on Task Engagement in a Young Child with Autism in an Inclusive Pre-School Classroom. 2000;35(3):326–335. Muzzarelli L, Force M, Sebold M. Aromatherapy and reducing preprocedural anxiety: A controlled prospective study. 2006;29(6):466–471. Namazi M, Amir Ali Akbari S, Mojab F, Talebi A, Alavi Majd H, Jannesari S. Aromatherapy with citrus aurantium oil and anxiety during the first stage of labor. 2014;16(6):e18371. Pontifex MB, Saliba BJ, Raine LB, Picchietti DL, Hillman CH. Exercise improves behavioral, neurocognitive, and scholastic performance in children with attention-deficit/hyperactivity disorder. 2013;162(3):543–551. Rashidi-Fakari F, Tabatabaeichehr M, Mortazavi H. The effect of aromatherapy by essential oil of orange on anxiety during labor: A randomized clinical trial. 2015;20(6):661–664. Ventura AK, Mennella JA. Innate and learned preferences for sweet taste during childhood. 2011;14(4):379–384. Verburgh L, Königs M, Scherder EJA, Oosterlaan J. Physical exercise and executive functions in preadolescent children, adolescents and young adults: a meta-analysis. 2014;48(12):973–979. Wilson M-MG, Morley JE. Impaired cognitive function and mental performance in mild dehydration. 2003;57 Suppl 2:S24–9. Xu J, Xu H, Liu Y, He H, Li G. Vanillin-induced amelioration of depression-like behaviors in rats by modulating monoamine neurotransmitters in the brain. 2015;225(3):509–514.